Packed House of Worldly Treasures! Packed House! Travels and Treasures! Sale in College Park East! Vintage Silver Halliburton Cases with Covers Buffet and Cabinet Oversize Chair And Ottoman Dining Table Headboard Leather Chair Piano Bench Faux Trees Antique Cabinet Woven Framed Tapestry Native American Lithograph. Selection Of Women's Contemporary Clothing Women's Shoes Size 9 Men's Shoes Children's Dresser and Nightstand White Outdoor Bench Pots and Plants Garden Stuff Selection of Home Decoration Black Leather Office Chair Kewpie Dolls Doll Collection Rock Collection Samsung Electric Dryer Beer Steins. Kitchen Items Linens Table Lamps and more! Come and check out the sale! Thank you! Dining Table and Chairs Glassfront China Cabinet. Chaise Lounger Barbecue Pots and Plants. Office Desk Men's Casual Shirts Dishware Very Large Metal Birdcage Full Size Bedframe Tools Garden Accessories End Tables Table Lamps Nice Selection of Home Decor Framed Artwork and more! Come by and check out the sale! Thanks! 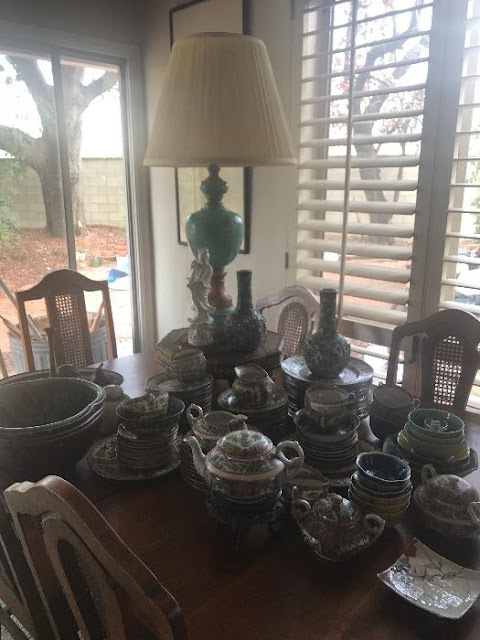 Pots, Plants, Antiques and more! May tag French Style Stainless Refrigerator Maytag Front Loader Washing Machine Maytag Dryer Stainless Long Kitchen Work Table. Antique Secretary. Antique Bookcase Antique Sewing Machine Butcher Block Kitchen Table and Chairs Barbecue Section of Outdoor Patio Furniture Dresser Firepit Tools. Antique Trunk Assorted Household Items Records Beautiful Floor Rugs. Wood Wine Rack Office Desk Filing Cabinet Floor and Table Lamps Staghorn Ferns Big Selection of Large Potted Plants Garden Decor and more! Come and check out the sale! Thanks!